I’m on a “then and now” kick with these because I think they are fun, and hopefully you do as well, please let me know! Today’s is a photo of San Francisco from sometime in the 1890s at the corner of California and Sansome Sts. and Google Maps shows the same location today. Of course, much can change in 120 years, but I have to think that most of these buildings and structures were lost in the Earthquake of 1906. Make sure you really zoom in and take a look at all the windows and signs, as they are the most interesting thing here! San Francisco circa 1890s. 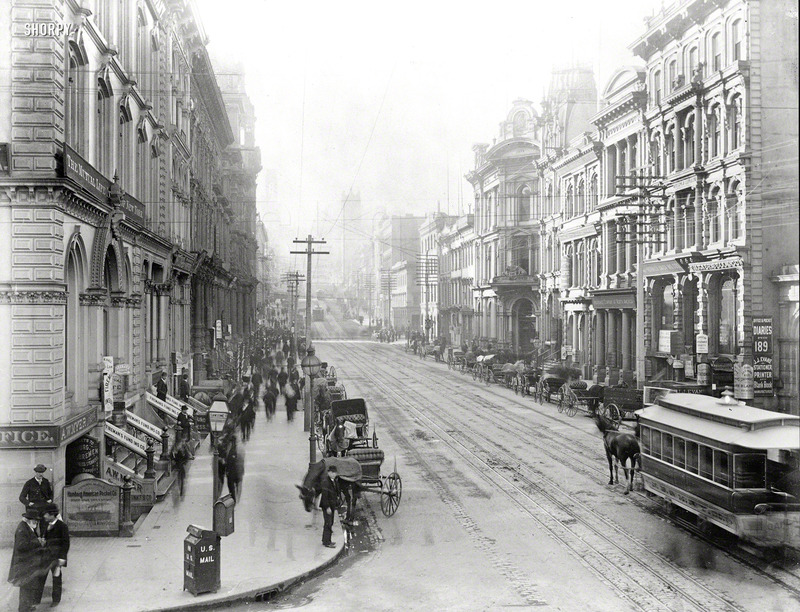 “California Street from Sansome Street.” With a horsecar passing by. Copy negative of a photo by I.W. Taber.